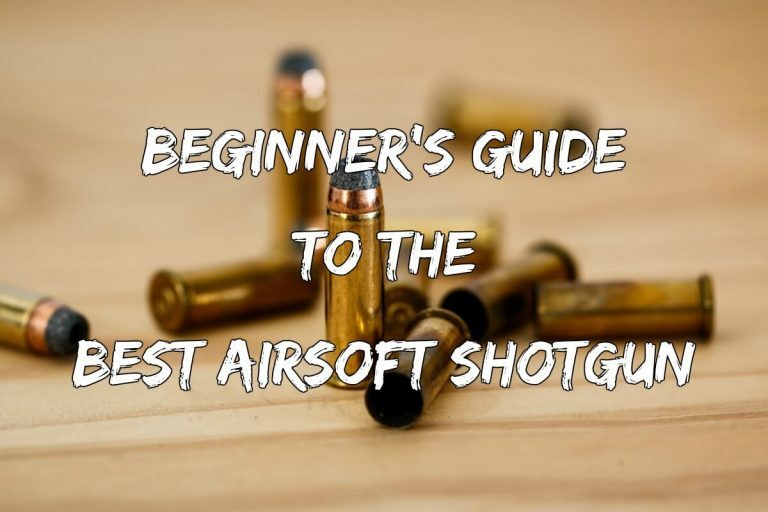 So you’ve gotten into the airsoft hobby have you? Perhaps you’ve been practicing for a few months and want to improve your accuracy and range? The answer is simple. It’s time to get a scope for your gun. However, what kind of scope do you need? If you are a relative beginner to the hobby, you may find all the choices confusing. This may lead to you picking up the first scope you find, and that is a bad idea. After all, not all scopes are created equally. In this article, I will teach you everything you need to know before you go out to the hobby shop or open that window to your favorite online retailer. We will also give you our picks for the best scopes on the market today. Before I get into the meat of the article, I feel it is necessary to expound a bit on the history of the scope as we know it today. The first efforts to give people aiming aid when firing date back to the 1600’s. However, these primitive creations had many performance and practicality limitations. The first documented telescopic rifle site was perfected between 1835 and 1840. By 1850 there were several manufacturers of telescopic sites. One notable one is William Malcolm of Syracuse, New York. He used achromatic lenses in his sites, like those in telescopes and made the elevation and windage adjustments better. His, along with L. M. Amidon’s were the standard telescoping sites during the Civil War. The first refractor telescope was built in 1880 by Augustus Fiedler of Austria and has been improving ever since. Scopes are great, especially for airsoft sniper rifles. They help improve your accuracy when you’re trying to shoot a target. • Telescoping sites improve long-distance shot accuracy which you will need for sniping. They also can help you spot an opponent in cover far out of rifle range. • Red Dot and laser sites improve hit rates in fast reflex CQB and mad skirmishes while making any rifle look ten times cooler. Though there are a lot of scopes out there, they can all be grouped into one of three types. Telescopic scopes magnify your vision and come in a wide variety of sizes. The size is written as #-#x# such as 3-9X40. Though it looks very much like an algebraic equation gone wrong, I promise this number has a meaning. The first part of the size, in this case 3-9x, is the magnification the scope will handle. This means that you can dial it from 3x magnification to 9x. This is a pretty large amount of variation, making this particular scope quite versatile and useful in a lot of combat situations. The second half of the size, in this case, 40 is the size of the lens in millimeters. Forty millimeters is a great lens size. It will give you a wide field of vision without being bulky. When you are engaging in airsoft combat, the last thing you want is a bulky lens. As an airsoft combatant, you really don’t need to worry too much about crosshairs. They are more of a fashion statement than anything else. However, the standard size for crosshairs is 30-30. You may also see Mil Dot, which is the actual military standard crosshair size. You may be tempted to buy these scopes. However, you don’t need to. The Mil Dot is basically a distance and range aid. It only becomes useful at ranges of over two hundred meters. Red Dot and laser scopes are not magnified. What you see on your scope is the actual size of the thing you are aiming at. These scopes are perfect for FIBUA, CQB and anything in close quarters where you need reflex from the hip or semi-aimed eye to site shots. These are also great for pistols. A red dot is a simple scope. It projects a red (or sometimes green) dot onto the inside of the lens. You’re the only one who can see this dot. If you’ve aimed properly, the dot will be on your target. If you are going to buy one of these scopes, it’s important to get a forty-millimeter lens. This size will be plenty large enough to hold a few inches away from your eye and still get a good view of the dot on your target. A laser site works much like a Red Dot site. The only difference is the site dot will be visible on your target. This is a brilliant tactic for scaring your enemy. However, they can give you away too. These scopes work best in low light, but most of them will give you a visible dot, even in daylight. There are actually several ways to mount this type of scope. Some can be plunked onto the top of a telescopic scope. Others can be mounted onto the pistol grip or barrel. To use a scope on your rifle or pistol, there needs to be a place to clamp it. You would think that makes sense, but it is actually something a lot of new combatants get confused about. So, how do you know that your rifle or pistol has the proper places for a scope? Firstly, look for dovetail grooves running along the top of the rifle or pistol body. This is the gun’s scope rail, site rail or base. You can use scope mounts to attach the scope to the rails. However, it’s important to make sure that your scope mounts work with both your rifle and the scope, seeing as there are different kinds. Scopes vary, and so do the rails they attach to. Determining which mount you need is not as hard as it sounds. First, measure the width between the rails. If it’s no more than 3/8 of an inch, you need standard mounts. If it’s 5/8 of an inch wide, you have a Weaver base. You’ll need Weaver mounts for that. These mounts get their name from their inventor. Most airsoft rifles need weavers, though some sniper rifles have standards. It’s also okay to measure up and check that the scope you get matches your rails. In fact, this is an excellent idea. Be extra careful if you have a scope with fixed mounts. These cannot be changed. So if you get the wrong size, you will have to send the whole thing back and trade for another model. 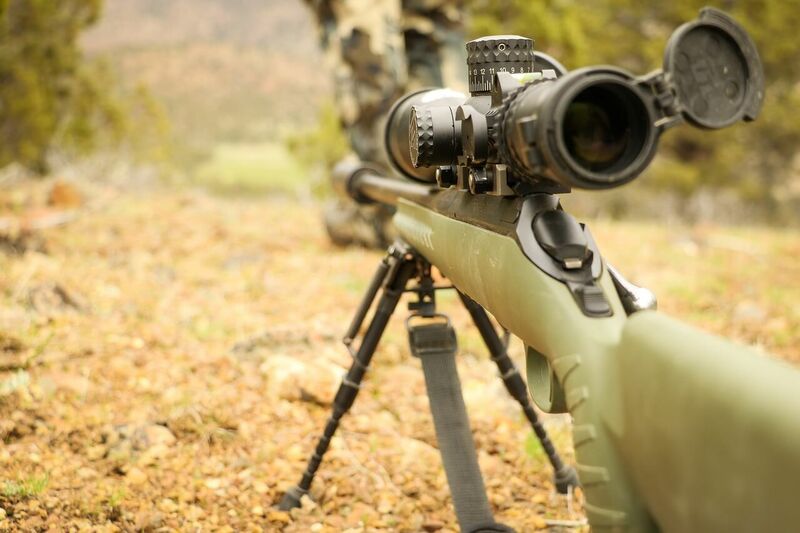 Now that you know a little bit about the types of scopes and their benefits, it’s time we discussed how to choose the proper scope for your needs. Red Dots are the most common type of site for airsoft and Real Steel combatants. These sites feature a glowing red dot in the middle of the lens. The advantage here is that you can see your surroundings and opponents in real time. You don’t have to switch from the magnified view. When you buy a Red Dot, there are several elements you need to consider based on your scenario. The first thing to look at is the objective lens diameter. A wider diameter allows you to see more of the target area while aiming through your site. However, a narrower width lens has a smaller profile. Though this gives you a narrower target area when aiming, it can lead to greater accuracy and better aims. Be sure to mind the intensity. If you are playing during mid-day in summer, for example, it will be necessary to increase the intensity of the laser so that it will match the outside light coming in. If the intensity is too low, you might have difficulty seeing your target. This can really mess up your accuracy. For some airsoft shooters, magnified scopes are actually the best option. If you engage your target with precision and accuracy, then a magnified scope may work perfectly. The advantage of a magnified scope is that they allow you to more accurately calculate distance. No matter which scope you choose, there are a few things you must consider, such things as personal stance and eye relief. Poor eye relief can lead to an inability to quickly acquire your target once you have shouldered the weapon. Also, bigger is not always better. Not every scope suits every gun. Take into account the size of your piece before you go out to buy a scope. You want to buy a scope that fits your gun. Having a large scope on a small firearm can actually hinder you instead of helping. The most important thing to remember is that not all scenarios require the same scope. Choose what works best for your situation and is the most versatile. That way, you won’t have to change scopes as often. Now you know the history of the scope, the types available, how to mount one and how to buy one, it is time for the reviews. These are my picks for the absolute best scopes on the market today, and perhaps they will help you to find the one that is right for you. This scope is an excellent one for you if you are one of the people for which a magnified scope is needed. The specification of the scope is 3-9×40. It has a 3-9x magnification, and an objective diameter of 1.57. The exit pupil is 0.2-0.67 inches. The length is 12.20 inches. It even comes with free mounts. You don’t have to buy them separately with this model. The scope is also water-resistant. This means makes it usable, even when the conditions are rainy and you are having to huddle under a tarp. Even when wet, the optics come in crystal clear, and no water will get into the scope. Furthermore, this is a durable scope. It holds zero like a charm and the accuracy you get can’t be beat. The mounting rings will not fit on all models, and they sit a little high. However, you can simply get other mounts if you find this to be the case. Another great Scope is the Vokul Tactical 3-9x40MM magnified scope. This one features the standard 3-9X magnification and 40MM objective lens with. However, it is more than just a magnified scope. 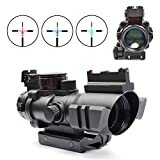 It comes with a detachable red laser and Red Dot site, essentially making it possible to use it as either of these two types of scope, allowing you to acquire fast-moving and close-quarters targets quickly. The reticle is illuminated in red or green. You can also pick from one of several different intensities. If you need something that will withstand the elements, this one has you covered. It’s shock-proof, water-proof and fog-proof. Be prepared to see clearly all the time. As for distance, this scope is good for up to five hundred yards, making it perfect for air rifle combat. The Monstrum Tactical 3-9×32 may not have the standard objective lens width, but it still has the standard amount of magnification. Further, you can use it to site things at a distance of 300 yards. The reticle has five adjustment settings, and can display both red and green for added visibility, no matter the light condition. The objective lens width is adjustable, allowing for sharper clarity and a removal of parallax. 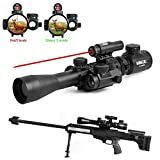 This scope even includes a range finder reticle with markings that allow you to estimate distance or compensate for bullet drop. The OTW scope is possibly the best out there for its price. It features a three-color, triple-illuminated rapid-range reticle. There are two weaver rails on this scope, so you will need weaver mounts. However, one attaches to your laser and flashlight. This scope has two sites, a glow-fiber front site and a pistol-style site. This means you will acquire targets much faster. If you intend on shooting in the elements, this scope is completely waterproof. It is also shock-resistant and fog-proof. The only downside to this scope is that the magnification is fixed. You cannot zoom in or out. A scope can really help your accuracy when shooting. However, there are a lot of different scopes out there, though they fall into three main types. Now that you have read this article, you know what the types of scopes are, the history of them, the meaning of scope sizing, and you have some reviews of the best, most affordable scopes on the market. Now it is your turn. Go out, buy a scope, and start firing!